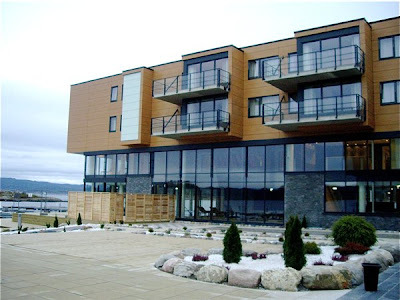 Quality Spa & Resort Son is located in a small quaint community by the Oslo fjord and less than an hour away by car from the Norwegian capital. It is a brand new hotel, opened on November 1st. This means that there are no wear and tear, as less than a dozen people have slept in your bed and taken a shower in your bathroom for the night. If you think that this is a good thing, I would say yes and no. The house and its interior may be brand new, but the risk is that the personnel is equally new and inexperienced. They were, and that made the difference. Quality Spa & Resort Son is located by the fjord and close to the idyllic Son community. 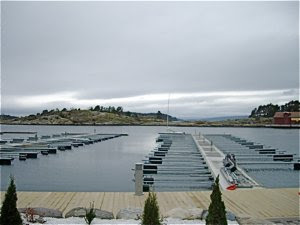 This is a beautiful spot, with small islands and the fjord just in front of the hotel. The only thing disturbing is the smoke from the chimneys of Hurum fabrikker a paper mill clearly visible on the other side of the fjord. 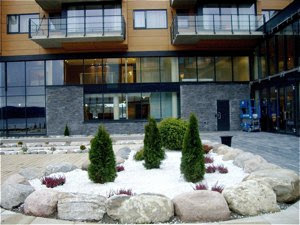 Quality Spa & Resort Son is easily accessible by car, as Oslo is only 50 kilometers (31 miles) away, and there are parking connected to the hotel. If you rely on public transportation getting there is much worse. Take the suburban train from Oslo to Moss and leave at Sonsveien station. Check whether you may book a taxi, as the hotel is a 10-15 minute ride away from the station. The service at Quality Spa & Resort Son varied from good to quite bad. The receptionists were kind, attentive and professional. My experience when seated in the bar was quite the opposite. I sat down in the trendy bar area and it took the bartender 10 minutes to approach to ask me whether I wanted something to drink. She was clearly inexperienced, but it is important for the hotel management to train the personell properly to be attentive. The waiters in the restaurant were equally inexperienced. I will return to this when reviewing the food later. 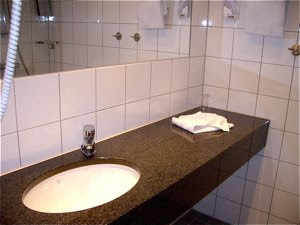 Medium sized bed- and bathroom. 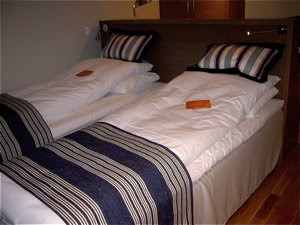 Two very comfortable beds, rather small, barely 80 cm (a little over 2 feet) wide. 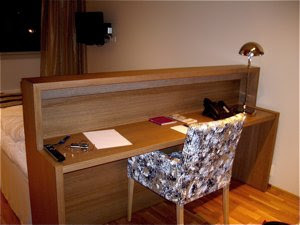 Smart interior, as a comfortable large desk was built into a wooden wall that worked as a bed end. Pleasant colour coordination. White walls, light wooden floors matching the furniture. Pleasant, but a little boring and unadventurous. The wooden floors are a bliss, carpets are very unhygienic as they are very hard to clean and maintain. Style? I would call it designer, but this was more the case for the hotel than the room. There were some details that a designer somewhere thought were clever. I refer to a plastic, steel rocking chair - a strange, not very comfortable piece of furniture. I would suggest that the hotel changed this piece with a more comfortable chair for the guest to sit and relax in after a refreshing spa visit. Quality Spa & Resort Son was a brand new hotel, this meant absolutely no wear and tear, the room and bathroom were immaculately clean and well maintained. Other details. No mini bar, hair drier or coffee machine. A very smart adjustable flat screen TV with remote control to watch as you try to sleep in. 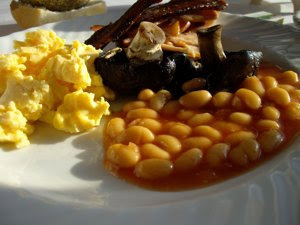 Quality Spa & Resort Son offered a decent breakfast included in the price - hooray! Bacon, eggs, beans in tomato sauce. Several kinds of breads and rolls. Cheese and boiled ham. Fresh fruit, yogurt, coffe and tea as well as apple and orange juice. Eat and off to enjoy a spa. As you are off the beaten track at Quality Spa & Resort Son the hotel offers an indoor restaurant and a bar area. The food served varied a little in taste and quality, but this may improve by time - I certainly hope so. The restaurant and bar is located in a large open room that feels a little sterile and cold. There are exercise and well being facilities in abundance. A 19 meter swimming pool, a pool with cold water, as well as in- and outdoor jacuzzi. You may also enjoy an outdoor hot tub with a Finnish sauna. The Magic Circle is a separate area with waterfall, foot bath, eventshowers, relaxrooms, and different saunas; steam, Finnish and caldarium with light therapy, foot sauna and mistroom. Quality Spa & Resort Son has air conditioning, and WIFI zone for the customers. 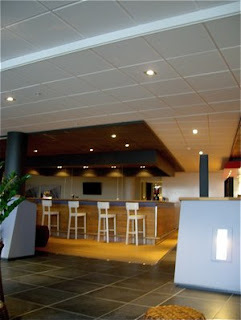 There are large areas to sit down and rest on the ground floor facing the fjord. I personally missed a few smaller and more secluded zones, as it felt as sitting in an open, sterile and bare hangar. There are parking facilities directly connected to the house. Quality Spa & Resort Son is extremely well maintained and cleaned, but it had barely been in use when we visited it. A Spa packet costs NOK 1895 (€ 235) includes double room, bath robe + slippers, full pension, incl. 3 course dinner, access to the Spa department on the ground floor. I know that the price includes full pension, but this means per person. 3800 NOK per room is very much to pay, and this does not state whether a standard massage is included in the price or not. The website says access to spa department, nothing more. Quality Spa & Resort Son is an immaculately clean, new designer hotel, with an unexperienced staff. 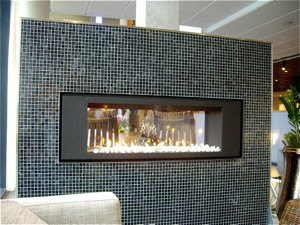 A modern, but a bare, rather cold interior, at a wonderful location by the Oslo fjord. There is much potential here, but the price is per person and rather steep.